The use of several small cylinders in this unique hydraulic-press design allows more precise control of material flow, a must in the exacting work of producing heat-exchanger plates. A new forming line at the York, PA, facility of GEA PHE Systems employs hydraulic-press technology containing many small cylinders rather than one large one, to achieve full force. The small cylinders fill faster and require substantially less compressible oil compared to a press with a large cylinder and longer stroke, resulting in much faster cycle time and higher output. As a leading U.S. manufacturer of gasketed, fully welded and brazed-plate heat exchangers, GEA PHE Systems NA, Inc.’s products find use in residential, commercial and industrial applications in sectors as diverse as chemical, food, sugar, marine, power, HVAC, renewable energy and refrigeration. Part of the GEA Process Equipment Division of the international GEA Group, the company maintains production facilities in Germany, Sweden, Canada and India as well as the United States, and distributes the heat exchangers worldwide. To gain productivity and maintain precise material control throughout the forming process to produce the heat exchangers, the company has employed a new short-stroke multi-cylinder hydraulic press from Schuler Inc., Canton, MI. Compact, efficient and cost-effective heat-exchanger designs at GEA PHE Systems depend on precise engineering and manufacturing, with tolerances as tight as 0.002 in. for channels and bevels. • Develop an automated system requiring a single operator. 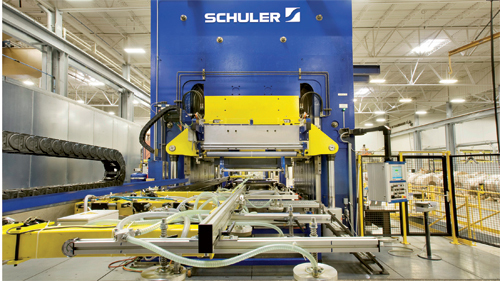 Schuler responded with a concept for a custom hydraulic-press system featuring a short-stroke, multi-cylinder design. This approach allows precise material flow with high final quality—no wrinkles or defects, according to Schuler officials. The new hydraulic-press system at GEA PHE Systems includes a decoiling line with shear, automatic feeding with a single-rail shuttle into the embossing press and a die-change cart able to simultaneously handle three dies. A single-rail shuttle removes formed plate from the embossing press and transports it to a blanking press. The exit side of the blanking press features gantry-type automation to remove and stack the plates. 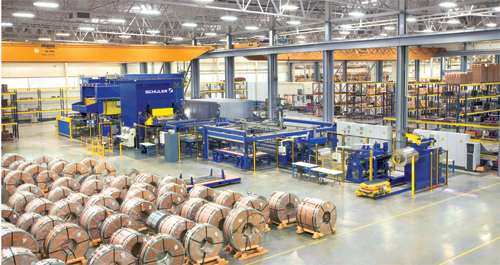 The system—Schuler engineered, manufactured, delivered and installed it as a turnkey project—includes a decoiling line with a shear, automatic feeding with a single-rail shuttle into the embossing press and a die-change cart able to simultaneously handle three dies, allowing complete die change in less than 30 min. It also includes a single-rail shuttle that removes formed plate from the embossing press and transports it to a blanking press. The exit side of the blanking press features gantry-type automation to remove and stack the plates. The press employs many small cylinders rather than one large one, to achieve full force. The small cylinders fill faster and require substantially less compressible oil compared to a press with a large cylinder and longer stroke, resulting in much faster cycle time and higher output. Repair time and expense also are greatly reduced compared to what a large-cylinder design would require, say Schuler officials. In addition, the multi-cylinder design allows GEA PHE Systems to make heat-exchanger plates in a variety of sizes, providing the flexibility to meet changing production needs and customer demand. The company now produces as many as four parts/min., with one operator handling the entire process. For the 28,000 tons of force provided by the press, the output rate is believed to be one of the best in this industry, add Schuler officials. John Garrity, production manager for gasketed-plate heat exchangers at GEA PHE Systems, likes the press’ versatility and high level of automation. Though designed specifically to meet the needs of GEA PHE Systems, Schuler sees numerous other opportunities for its multi-cylinder technology. “The market for this type of multi-cylinder hydraulic-press technology is fairly diverse,” says Oliver Beisel, director of sales for Schuler Hydrap. “While well suited for complex applications such as that at GEA PHE Systems, it’s also ideal for deep drawing stainless steel in applications such as kitchen sinks.” For deep drawing stainless steel, the system works in combination with an active die cushion and a multi-cylinder plate, which functions as a hydraulic cushion underneath the blankholder. In contrast, in an embossing press the multi-cylinder plate only applies press force. Brazed-plate heat exchangers manufactured by GEA PHE Systems consist of formed stainless-steel plates, brazed together in a vacuum furnace. 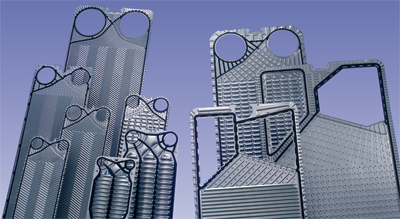 The company’s gasketed-plate heat exchangers consist of formed plates in several materials, including stainless-steel types 304 and 316 as well as titanium and other rare alloys. The plates feature NBR, EPDM, Viton and Hypalon gaskets and are assembled in a frame in carbon (painted or cladded) or stainless steel. When stacked, the plates form two separate flow passages, allowing a liquid or gas to flow between every other plate. The result: high-performance heat-transfer surfaces in a compact, cost-effective design. GEA PHE Systems forms these heat-exchanger plates on its new multi-cylinder hydraulic press. Information for this article provided by Schuler Inc., Canton, MI. Tel. 734/207-7200; www.schulerinc.com.